This Florence apartment hosts up to 4 people. It features fully equipped kitchen which is divided from the living room and a dining room with table for 6 to 8 people. It has 1 bedroom with double bed and in-room micro pool with different types of treatments, such as chromo-therapy and jacuzzi. There is also a studio which can be remodeled into another bedroom for 2 persons and a second bathroom with sensual Sensory shower. In the cosy living room you can enjoy in the library filled with Florence history books, just next to warm fireplace. On the top of all amenities, there is a courtyard with sofa where you can relax and taste different types of the best Italian wine. The Brunelleschi Exclusive apartment is located in the same building as the apartment Brunelleschi Exclusive 2. For check-in from 18:00 there is an extra charge of 40 €. The apartment Brunelleschi Exclusive is located in Duomo area. Brunelleschi Exclusive apartment in Florence is located in Via Ricasoli, in the strategic central position of the city, just between the Gallery of the Accademia di Belle Arti where you can see the original statue of impressive Michelangelo's David and the Orto Botanico, one of the oldest gardens in Europe, established in 16th century. This Florence´s apartment is also just a few steps away from the Basilica di Santa Maria del Fiore, better known as il Duomo, and the historical Piazza della Repubblica. 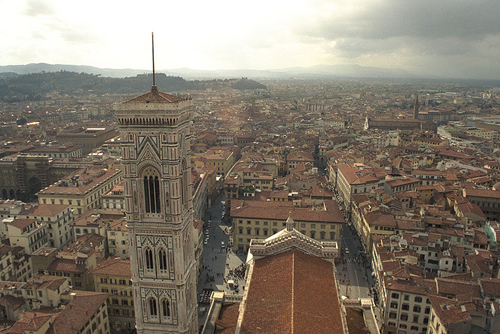 It is an excellent location to experience Florence's landmarks in all of its glory. In this area of the city, you can just walk through astonishing Florentine streets, filled with small restaurants, beautiful flowers and enchanting melodies coming from everywhere, and you will genuinely feel the charm and uniqueness of the Italian way of life. Galleria dell´Accademia - 0.10 km. San Lorenzo Market - 0.37 km. Brunelleschi Dome - 0.44 km. Magnificent apartment in Florence, situated in Via Ricasoli, just a couple of minutes away from il Duomo - the famous Florentine landmark. It offers everything you need and more for a comfortable and delightful stay in the Capital of Tuscany.